It is so stinkin’ hot outside that I cannot stand it! I should be swimming! I should be in a pool with crystal clear water swishing around me and enveloping me as I dive into the cold, delicious water! Oh dear. I lost control for a minute. I’m sorry you had to see that. Ahem. Okay, I’ve pulled it back together. It’s not easy to do when it’s 95 degrees out and you’re not sure if your air conditioner is going to hold out. It’s almost too hot to eat. Almost. I don’t know that I’ve ever really been too hot to eat. In fact, I don’t think anything gets in the way of my eating. So when the thermometers are screaming with high temperatures, I want something that is refreshing. 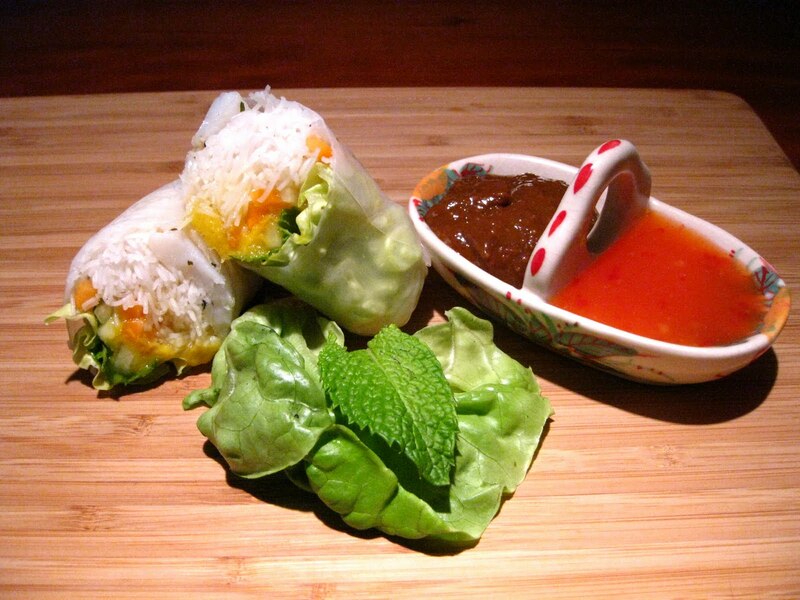 Enter Vietnamese Spring Rolls. I have wanted to make these forever. Well here was my chance. These would taste great on days like these. They are fresh and light and just the thing when the temperature is on the rise. Now, I’ve never made them before but they didn’t look too difficult. 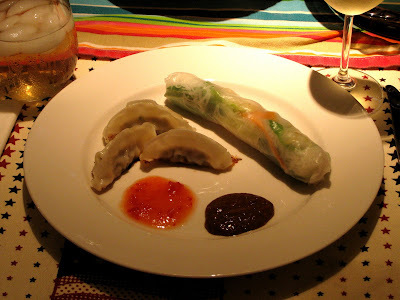 One of my absolute favorite blogs is http://www.steamykitchen.com/. Jaden Hair is amazing. You really should check out her blog. It is one of the best around. She had blogged about the spring rolls a while ago and I knew I had saved the post. I dug it out and used this as my main guide, plus I made the sauce from her post. 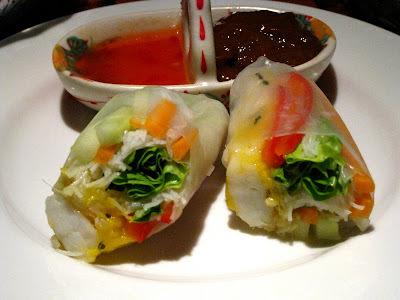 The thing about these Vietnamese Spring Rolls is that they are not baked or fried. They are totally fresh. And you can put just about anything you want into them. I stayed pretty traditional on my ingredients. I did all of the prep work in the kitchen and then Bob and I made them at the table. It really was a lot of fun! We began by taking one rice paper, dipping it in the water. Then we started constructing our rolls. First up was the shrimp. Next the lettuce, vermicelli noodles, carrots, red pepper, cucumber, mango and finish with 2 mint leaves. Then it was time to roll it all together. Jaden says to “try to keep the filling compact and piled on top of the shrimp.” She instructs to start with the side closest to you, “roll up the roll tight, stopping halfway to gently tug back on the roll to tighten.” As you will quickly find out when working with rice paper wrappers, they stick to themselves very easily. So as you roll and the paper comes in contact with itself, it will seal. We just folded ours up like a burrito. This is Bob’s roll. Isn’t it gorgeous? His is prettier than mine because I don’t put the red pepper in mine. You will not believe the taste! Oh my gosh! The mango and the mint absolutely sing in your mouth! The shrimp and the vegetables are so refreshing and taste so incredible together. And you can see the dipping sauces I made to go with them; sweet chili sauce and cashew butter dipping sauce. I kid you not, these things will make you swoon. This is my roll. Doesn’t it look yummy? Look how nicely rolled it is and how the wrapper is tight around the filling? Doesn’t it just look like a picture? Okay, time for true confessions. This was the second time we had them. The first time we made these we took pictures of the first roll I made. We were so hungry that we didn’t really take a good look at the picture before we polished off dinner. I about fell off of my chair when I downloaded the pictures. I yelled for Bob. He came hobbling over on his crutches to see why I was darn near hysterical. Ah hell; I can’t explain it. Take a look for yourselves. See? There was no way I could blog and use that picture!!! I’d have to put a disclaimer on here and post an X rating for the blog … and it wouldn’t be referring to my size! And that’s all I’m going to say about that! Please disregard the picture of my first attempt and rest assured that these are fun to make, healthy, and a perfect meal on a stinkin’ hot day. By the way, the cashew butter dipping sauce is so incredibly delicious it defies explanation. And the sweet chili sauce is every bit as good. We couldn’t decide which we liked better so we would alternate bites until we got to the point where we slathered both sauces on at once. You simply have got to make these! And ladies … uh, like I said, that’s all I’m gonna say about that! Sauté shrimp and garlic in olive oil. Let cool. Slice each shrimp down the middle of its back so that you have two identical halves of shrimp. You will need a dish to dip the rice papers in; one deep enough to submerge the whole paper at once. I found that a deep dish 9” pie plate did the trick. Fill it with room temperature water. Dip one rice paper round in the dish for a quick 2 seconds. Lift round and let the water drip off. Place on clean, dry work surface. Blot the top of the round with a paper towel. You’ll work one roll at a time. Now it’s time to roll. The wrapper will still be a little stiff. By the time you finish piling on the ingredients, it will have softened enough to roll. Lay 4 halves of the shrimp in a line near the bottom 1/3 of the round. 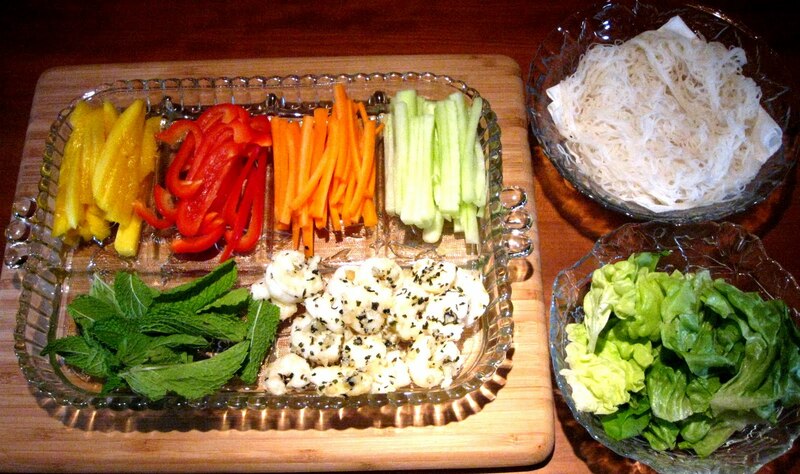 Top with some lettuce, vermicelli noodles, carrots, bell pepper, cucumber, mango, and finish with 2 mint leaves. Try to keep the ingredients compact and piled on top of the shrimp. Starting with the side closest to you, roll up the roll tight, stopping halfway to gently tug back on the roll to tighten. The wrapper is self-sealing. You can use a sharp knife to cut off the two ends to make it look neater. Most recipes for dipping sauce call for Peanut Butter, however a Cashew Butter or even Almond Butter is more fragrant, delicate and oh-so-delicious. I like my sauce a little thin, so that when I dip my roll in the sauce, it lightly coats the roll and I can still taste the fresh, vibrant vegetables inside. In a small saucepan over medium heat, warm the oil. When it is hot, add the garlic and cook until fragrant, about 30 seconds. Add hoisin, sugar, chili garlic sauce, cashew butter and water, whisk and simmer for 1 minute. You can add an additional tablespoon of water for a thinner consistency.